Outdoor Bark Control Unit. Ultrasonic- Stop Dogs Barking. Sent within 24 hours of payment being received. (From our Qld Warehouse). No Mains Power needed-Battery Operated-Waterproof. It emits an ultrasonic sound to defer barking dogs effectively but quietly. 2.Detects barking up to 50 feet away. 8.Up to a 50 feet range keeps all dogs within that range quiet. Does your dog bark too much? Maybe your neighbor's dog barks too much? Now there is a solution to excessive barking - even if it's coming from someone else's dog! This decorative electronic birdhouse is really an Ultrasonic Bark Control Device to control nuisance barking! Designed to look like an Bird House, the Deluxe Outdoor Ultrasonic Bark Control System can hang in a tree, at home anywhere in your yard, whether it is hanging up or free-standing on a table or other area. When the Deluxe Outdoor Ultrasonic Bark Control alarm clock detects excessive barking, the microphone picks up the barking and activates the unit. This results in a safe high pitch ultrasonic sound that is audible to dogs, but not to humans. The offending dog hears the sound and will stop barking. Since it is unpleasant to the dog, the dog learns to stop barking! 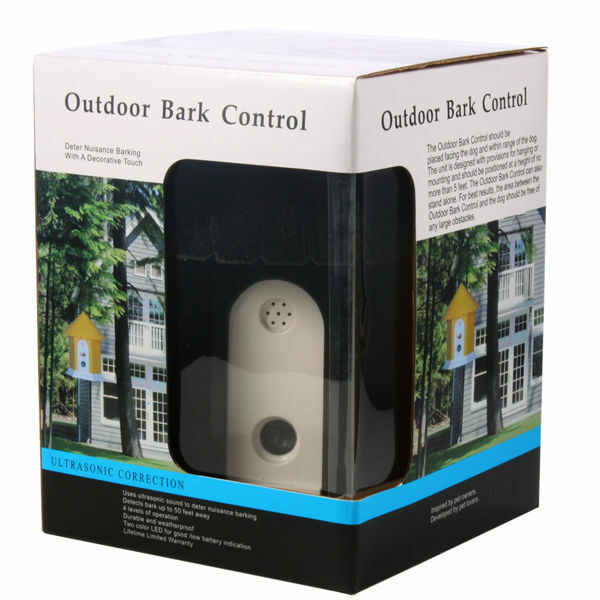 Designed specifically for outdoor use, this Deluxe Outdoor Ultrasonic Bark Control device is durable and weatherproof. You can choose from 3 sensitivity levels (activated at 15, 30 or 50 feet) as well as a test level audible to humans. Requires 9 Volt Battery, (not included) with an average battery life of 2 months. The Deluxe Outdoor Ultrasonic Bark Control alarm clock has a power indicator and can be set to 'Off' to conserve the battery when you're away. Lifetime limited warranty on parts, one-year warranty on labor. Excessive barking can cause a real strain on your relationship. 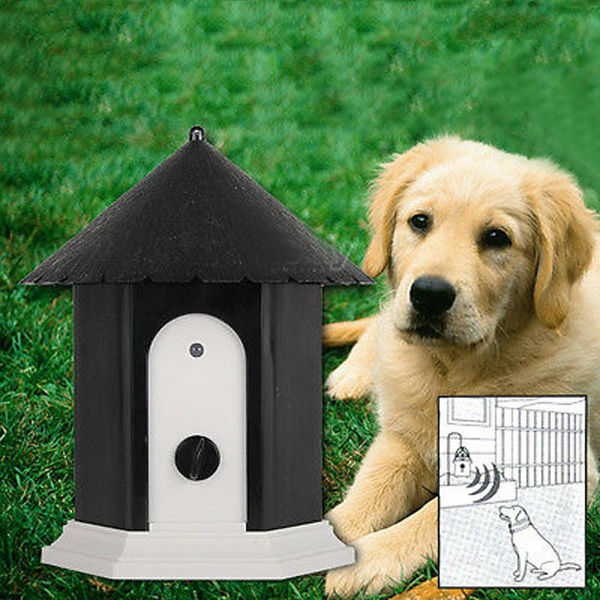 The Deluxe Outdoor Ultrasonic Bark Control alarm clock controls outdoor barking and no collar is needed! Safe and effective for all breeds and sizes of dogs.